Here we see the first archeological evidence of cosmetics. It seems affluent women applied a bright green paste of copper minerals to their faces to provide color and definition of features. They used perfumed oils and painted eyebrows on themselves with cream made from sheeps fat, lead and soot. It might seem to some that they used the perfumed oils because of the face makeup. 1500 BC The East: In China and Japan rice powder was used to paint faces pasty white. 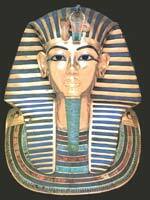 Eyebrows were shaved and plucked, and teeth were painted gold or black and Henna dyes, were used to stain hair and faces. In other words, teenagers looked exactly as they look today. 1,000 BC Greece: If you were an upper class Greek you probably wore a wig to hide the fact that you seldom bathed. This was true of both genders. Again everybody wanted the "real white" look given by wearing chalk or white lead face powder. (No report on what the incidence of lead poisoning was like in ancient Greece). When women wanted a "little color" they chose ochre clays laced with red iron for lipstick (Mmmmm, tastes good!) They spread their palms with reddish henna, supposedly to look younger. These practices roughly coincide with the perfection of soap. These super-civilized ancestors put barley flour and butter on their pimples, and sheeps fat and blood on their fingernails for polish. Their crowning contribution to cosmetics was the practice of taking mud baths laced with crocodile excrement for who knows what purpose. Men frequently dyed their hair blond, supposedly to look like the young guy in the Dell Computer commercial. The practice of hair dying among men and women alike was curtailed, as dyes were so caustic as to cause existing hair to fall out. They had specially dedicated slaves to apply their cosmetics. 14th Century: Cosmetics were regarded as healths threat because many thought they would block proper circulation. In Elizabethan England dyed red hair was fashionable. Well to do women wore egg whites over their faces to create a whiter countenance and also slept with slices of raw beef on their faces to get rid of wrinkles. I think some English playwright wrote something to the effect "A beautiful woman is like a delicatessen?" .Then again, maybe not. 15th -16th Centuries: In Europe, only the aristocracy used cosmetics. Italy and France became the chief centers of Cosmetics manufacturing. The French perfected the art of creating new fragrances and cosmetics, by blending ingredients. This laborious process gave birth not only to the means for producing modern cosmetics, but also for murder, as arsenic was sometimes used in face powder instead of lead, simply to kill the wearer faster. 17th -18th Century: Cosmetics are now in use by all except the very poorest classes of society. Red rouge and lipstick were used extensively to suggest health, wealth and gayety. 19th Century: France again. They develop chemical processes to replace fragrances made by the natural methods. Zinc oxide becomes widely used as a facial powder, replacing the more deadly mixtures of lead and copper previously used. Other poisonous substances are still used in eyeshadow (lead and antimony sulfide), lip reddeners (mercuric sulfide), and to make ones eyes sparkle (belladonna, or deadly nightshade. Hey, its important to look good! 1927: The chemical method for permanent waving is invented making it easier for many more women to have "naturally" wavy hair. 1930s: Movie stars such as Mary Pickford, Theda Bara and Jean Harlow begin to influence the style and use of makeup. Finally the "white look" starts to lose ground to the Hollywood "tan" look. In 1935 Max Factor of Hollywood introduces pancake makeup because of the adjustments required for photographing faces for film. Finally, women with food on their faces again. 1950s: We begin the modern era of the cosmetics business, as we know it. Face powders and makeup, tanning oils and fragrances are mass marketed to an essentially "new" post war society that is tired of shortages. Popular sponsors of radio soap operas transfer their ads to the new medium of television. 1960s: As in the Fragrance industry, this is a time of change, not necessarily for the better. Purple lips and Egyptian eyeliner make a comeback, butterflies show up painted on virtually every part of the body. Lets not forget false eye lashes. Food makes a comeback as botanical, and vegetable (carrot, watermelon) ingredients combine to create a back to nature look, smell, and attitude. 1970s: Certain ingredients are banned from use in cosmetics to protect endangered species, and other species currently used as "lab rats" by some cosmetics manufacturers. This age of environmental concern fosters the start of many movements demanding disclosure from the cosmetics industry-asking questions like "What did you do to those poor innocent puppies and bunnies to get this cosmetic product approved"? "Whats in it, what does it do, where does it come from"? 1980- Present: The key seems to be "diversity" as new looks, cosmetics and beauty aids come together to form an enormous industry of over $20 billion in sales annually. We are aware of cosmetics, fragrances, hair and skin products every day as we are heavily influenced by ads in print, and on television. Now we turn to the Internet. It used to be that you had to go down to the flower store to buy flowers, the book store to get a book, the drug store for your prescriptions, the computer store to get a computer, the car lot to buy a car. Now items, which we wouldnt have thought of buying without personal sales counseling a decade ago, are bought thousands of times each hour, on the Internet. It is this way with cosmetics, fragrances and colognes. Whereas your general store, or department store operating during the first half of the 1950s might be able to stock 90% of the hot products and hot brands of the time, and have inventory "in the back" in case product suddenly ran out on the shelves, things have changed. There are more products, more brands, more advertising, more disposable income, and more demand for products advertised in magazines, billboards, television and the Internet. No brick and mortar (retail store-in-a-building) merchandiser could have everything all at once. The name of the game now is "e-tailing". The consumer can buy virtually any product, style, color, size, make, brand, price point; and have it shipped within 24 hours. This frequently represents less buyer time expended than a trip to the local mall. The convenience factor of dealing with your favorite e-tailer means a lot. Selecting cosmetics is oftentimes less buyer-intensive than getting the ripe tomatoes from the produce department of your local grocery store. You dont have to drive, squeeze, or wait in line.